Controversial Armenian film by Sergei Parajanov arrives in high definition. “Art, no matter how high it rises, cannot forget the land which birthed it.” - Martiros Saryan. That quote, by a prominent Armenian painter, begins The Color of Armenian Land, a scarcely seen short documentary by Mikhail Vartanov which, at least in part, documents the making of The Color of Pomegranates, Sergei Parajanov’s historic film of tableau and symbolism. 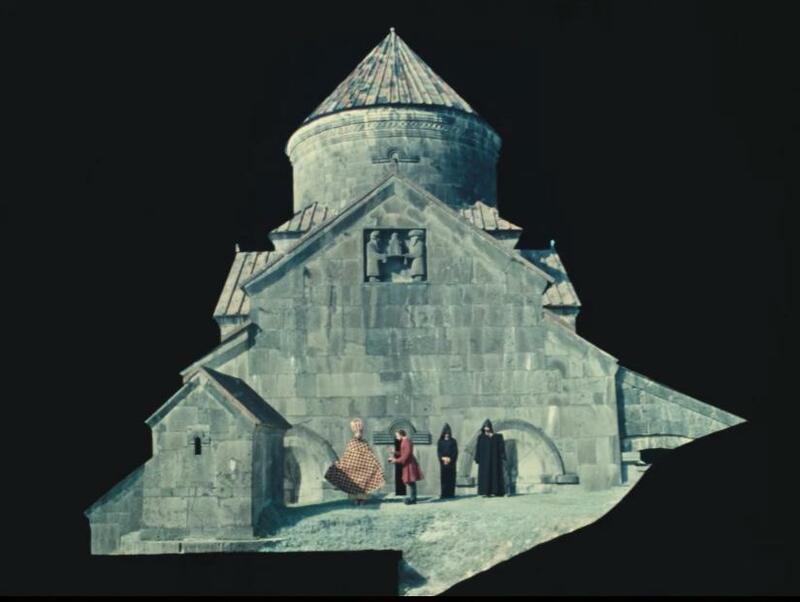 While many cinephiles work overtime to separate great art from any repulsive behaviors of its artist, Saryan, by way of Vartanov, and now by way of the Criterion Collection (The Color of Armenian Land is foremost among the numerous bonus features on their Blu-ray release, currently being reviewed), remind us that art, its artists, and the lands from which they hail, are all of a piece. Furthermore, most film buffs can and should point to the numerous times that the universal language of cinema has availed a bond to another time, place, race or way of life. And then there’s The Color of Pomegranates. Upon its recent Blu-ray releases by the Criterion Collection and Second Sight before that, the refrain of respectful perplexion in response to 1969’s Armenian celluloid hallucination that is The Color of Pomegranates has been uniform and consistent. The consensus, thus far, seems to be an “If you say so...!” kowtowing to the film’s unique collage of the personal and the historic, its torrid history and subsequent lofty reputation, and the fact that some beauty is simply, well, unknowable. And this is simply one of those times. But, can these adventurous viewers be blamed for arriving to this place? A reaction as such is not handwringing if it’s infused with true curiousity. In light of having finally experienced Pomegranates for the first time, this exhausted critic finds himself with little more response than that to serve up. It’s not that we can’t or won’t understand most of the film; it’s that we don’t get to. Not without taking an academic deep dive into Armenian history, culture and superstition, Christian symbolism, the life of national figure poet Sayat-Nova (“King of Songs”, 1712-1795), and the sometimes troubled, sometimes mischievous life and times of the film’s maker, Sergei Parajanov. Without all of that in tow, sitting through this film amounts to looking at a most ornate, impenetrable motion slide show; one with a deduced narrative built upon a soil of old-world metaphor set to atonal sitar music. Ostensibly about the life of aforementioned Sayat-Nova, Parajanov procured state funding for a biographical film on the occasion of the nationally treasured poet’s recent 250th birthday. When the resulting project proved too artistically oblique, the state ended up forbidding all direct references to the poet, and his work. This meant that the film’s title had to change from Sayat Nova to The Color of Pomegranates, and all of his poetry had to be replaced with original sound-alike verses, much like how Selma had to concoct new speeches for Martin Luther King, Jr., since Ava DuVernay was locked out from using the real things. This, among other reasons, resulted in at least two different cuts of Pomegranates. Not to be confused with the censored Soviet cut which made the rounds for years, it known as ‘The Yutkevich Cut’, Criterion presents ‘The Parajanov Cut’, now rediscovered and restored by The Film Foundation. Inspired by Tarkovsky’s Ivan’s Childhood (1962) and Kalatozov’s The Cranes are Flying (1957), Parajanov made Pomegranates as the follow-up to his career-shifting 1965 feature, Shadows of Forgotten Ancestors. Prior to that personally informed historic piece, Parajanov was just another maker of innocuous state sanctioned genre films, an output the filmmaker dismissed as silly once he gained auteur notoriety. There was no looking back, even as his then-illegal homosexual personal life sometimes landed him on the wrong side of law enforcement. For someone so immersed in “high art” filmmaking in between stints in jail, Parajanov seems to have been a surprisingly affable roll-with-the-punches kind of guy. In clips, we see his demeanor to be sardonic; his finished work to be unapologetic. 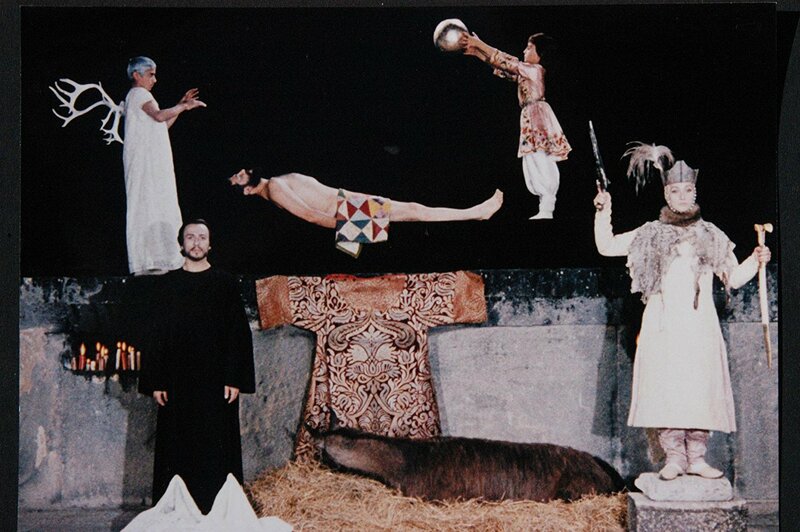 Parajanov utilizes several different actors in the central role of “The Poet” (i.e., Sayat-Nova). Melkon Alekyan makes an impression playing the future poet in his childhood, but it’s Sofiko Chiaureli who owns the role. In a bold move that’s frequently called out as such on the disc’s extras, Chiaureli plays not only The Poet as a Young Man, but also the unrequited love of his life, identified by the experts as Princess Ana, Sayat-Nova’s boss’s daughter. Due to the obviously low budget of the film, The Poet and The Princess can never share the frame. Chiaureli, though, packs all five of her credited roles in the project with androgynous mystery. The Poet, banished for his love, ends up a monk in a monastery, where he is eventually killed by an invading army’s ruthless siege. All of this and more is signaled in the continuing tableaus that comprise the film. Do not expect all of it, if any of it, to be readily apparent. There is an almost inevitable futility in any attempt by mere mortals to approach a true understanding of The Color of Pomegranates. That, however, hasn’t prevented Criterion from doing much to assist. The new Blu-ray disc is a fine one, serving up numerous bonus features which do everything they can in the pursuit of enlightening the surely baffled legions of cinephiles only now able to take on this celebrated Armenian work. None of this is to dissuade anyone who’s so inclined from checking out, or even purchasing a copy of The Color of Pomegranates. It’s a valued and admired relic of World Cinema with, perhaps, more tortured and tenuous stories surrounding it than within it. Should one be so adventurous to take on this film, one would do well to keep in mind that the sometimes reported "rapturous otherworldliness" of Parajanov’s visuals probably pops a great deal more on the big screen. At home, as ornately compelling as the various shots of blankly staring robed characters holding antlers, shells, sitars, and whatever else can be, they can also be more easily dismissed as performance art footage; something more at home in a gallery installation. 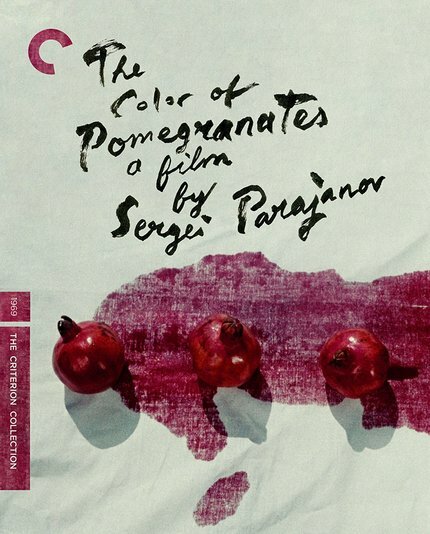 Still though, Pomegranates nevertheless emerges as the type of connecting agent for broader humanity in that "universal language of cinema" kind of way, albeit one of the most elusive examples to ever crack a Sight & Sound Top 100 list. (Last ranked by global critics in 2012 in an epic six-way tie for 84th place, along with Casablanca, Fanny and Alexander, A Brighter Summer Day, The Wild Bunch, and Greed). Criterion is increasingly well represented on the S&S list, now holding half of the 84th-placed films. The printed essay by Ian Christie runs many panels in its folded insert, and the video extras on the disc- some new, some old - run between 16 minutes to upwards of an hour. That’s not counting the feature length audio commentary by a very game Tony Rayns, who’s honest enough to call himself out as “foolhardy enough” to accept such a task. That admission aside, Rayns is obviously very well prepared, and in turn, does a great job. Just as pomegranates aren’t likely to replace popcorn anytime soon when it comes to moviegoing comfort food, no one will emerge from this disc a newly minted expert on The Poet, Parajanov, Armenia, etcetera. But, if this critic can eek out this review of The Color of Pomegranates having only digested Criterion’s bonus content in short succession after viewing the movie for the first time, then anyone can come away increasingly enlightened, even as we all come away confused.